So today I am basting and appliqueing circles, but then you've all seen that before. If you fancy something different though, you could check out Stephie's blog for her series 'How Long Does it Take to Make a Quilt'. 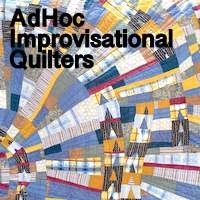 She has been kind enough to include me, along with Ann (last week) and Audrey (next week), in this series, even though I reckon I am probably one of the slowest quilters out there. She has done an excellent job of ordering and editing the information she got and writes really well too. You're supposed to sew slowly. That's the name of your blog! I just love how you fit in quilting in small increments of your time and your motto "Just get on with it." is just perfect. Instead of wasting time whining, it is better just to make the best of it. My sewing space is scattered too, although it is my preferences that made it that way. So good to read the blog post from Stephie - loved the interview and reading your thoughts on your quilting. So glad you gave us the "heads up" Kaja. I was looking forward to reading your interview! Stephie did a wonderful job with Ann's.